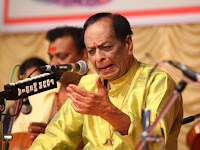 Veteran Carnatic singer M Balamuralikrishna passes away on 22nd November in Chennai at the age of 86. The golden voice of Carnatic maestro Balamurali Krishna has fallen silent but his music will live on till time immemorial. Vocalist, playback singer and composer M.Balamuralikrishna, who burst into the music world as a child prodigy, passed away on Tuesday in Chennai. He was 86. Balamuralikrishna has been awarded the Padma Vibhushan, India's second-highest civilian honour, for his contribution towards Indian Art. He was made Chevalier of the The Order of Arts and Letters by the French Government in 2005. Born into a musical family of Sankaraguptam, East Godavari District, Andhra Pradesh, Balamuralikrishna's parents, both experts in the veena and the flute, encouraged their son's talent. His music appealed to both connoisseurs and the laymen alike. His music will indeed be remembered by one and all.